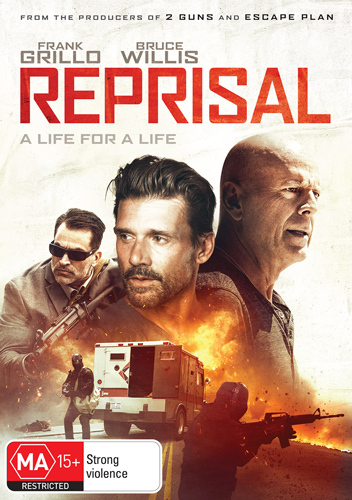 A bank manager (Frank Grillo) haunted by a violent robbery that took the life of a co-worker, teams up with his ex-cop neighbour (Bruce Willis), to bring down the assailant. While the two men work together to figure out the thief's next move, the highly-trained criminal is one step ahead and barrelling down a path of bloodshed that leads to an explosive counterattack and brings all three men to breaking point. The 'Reprisal' competition has now closed. Winners will be announced shortly. Competition opens at 5pm AEDT on Sunday 18th November 2018 and closes at 11:59pm AEDT on Sunday 25th November 2018. Five winners will be chosen at random on Monday 26th November 2018. To successfully win, entrants must fulfil the above entry conditions before the time the competition closes. Current members/followers are eligible to enter the competition. Only one entry per person. Only one winner per household. To be a valid winner, the entrant must not have won a prize from SWITCH within the last 28 days. Each winner will receive one DVD copy of 'Reprisal'. By entering, you agree to receive occasional emails from SWITCH in the future. If you decide to unsubscribe from these updates, any further entries will not be applicable. Only Australian residents are eligible to enter. 'Reprisal' is available on DVD on Wednesday the 21st November 2018 from Defiant Screen Entertainment.